I'm a sucker for cheap Chianti. Chianti - yes, in the wicker-wrapped bottle - was one of the first "real" wines I learned to love, gulped in uncritical draughts alongside pizza or maybe a chunk of lasagna at modest Italian-American restaurants with the standard red-checked tablecloths and plastic grapevines. I loved it then, and I love it still. Even after years as a wine guy whose good fortune it's been to sample a world of wines and even occasional sips of great, pricey vintages, I still take special pleasure out of uncorking a modest bottle of basic Chianti with a simple meal. Today let's take a look at a low-price Chianti made by Borghetto, a fresh young Chianti from the recent 2010 vintage, sold locally for a budget-level $7.99. Borghetto is more familiar for relatively pricey Chianti Classicos and Riservas, and this generic-level, single-digit Chianti is apparently just entering the U.S. market. I hope it becomes more widely available soon. Keep an eye out for it. Opening it on a hot summer day, it occurred to me to sample its fresh, tart flavors not against the usual red-sauced Italian-American fare but something unexpected, a fresh Caprese salad. Wine with salad? Don't knock it if you haven't tried it. A colorful Caprese composed on an oversize platter - thick, juicy rounds of just-picked beefsteak tomatoes, dusted with salt and pepper, a drizzle of fruity olive oil and a shot of lemon juice, each topped with a round of moist, fresh-made mozzarella and a nest of thin-sliced basil leaves - makes a remarkably good match with simple Chianti. The tart, dry wine seems to cozy right up to the juicy tomatoes, creamy mozzarella and aromatic basil all three. Add a crusty loaf of bread and you've got a light summer dinner. 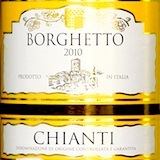 If you can't find the Borghetto in your neighborhood yet, substitute another favorite modest label - Gabbiano, for example, or the widely available Ruffino or the Whole Foods-label "365" Di Flora, both of which I reviewed in a 30 Second Wine Advisor report last autumn, "Good cheap Chianti, no basket." But whatever you pair it with, do treat yourself to a Caprese before summer runs out. It's hard to imagine a better thing to do with fresh garden tomatoes. FOOD MATCH: Surprisingly good with Caprese salad; it was very good, too, with garlicky fried okra fresh from our garden. Of course it will also go well with simple Chianti's traditional companions, cheese and sausage or pepperoni pizza or pasta with tomato sauce. VALUE: In today's market, it's not going to be easy to find a decent, appealing table wine at this price. If you can find this simple, rustic Chianti at this price, load up. WHEN TO DRINK: Very low-end basic Chianti like this is at its best when it is young and fresh. Aging potential is doubtful. If you want to cellar a couple of bottles to see what happens, it would be a cheap experiment at this price, but I'd plan to buy it for early enjoyment. This bottling may prove elusive. Wine-Searcher.com finds only one Ohio retailer offering the 2010 for $7.99 The Ohio-based importer also distributes in Louisville, where I found it. For more information about distribution, >try contacting the importer through this link.